The penultimate post on this blog was a hastily written snippet about all the things I’ve been doing recently. I only really get round to doing things when I’ve got hundreds of deadlines looming on me, and I get a bit wild-eyed and sleep-and-food-deprived and twitchy, like I’ve jabbed myself in the leg with one of those Brazil nut pens. It’s probably not the most efficient way to work, but it suits me quite well. However, I’ve also realised that being really busy can also make you really boring. My friend Seamus is a massive workaholic and we’ve embargoed conversations about how busy we are, because they just descend into “Yeah, I’ve been really busy lately too. Yeah, loads of stuff.”. So, dear reader, I am going to stop moaning about having too much to do and instead tell you about some of it. It doesn’t really have a title yet. On Friday, it was Trailer Trash: David Lynch. This is Rosy’s event that I mentioned earlier. 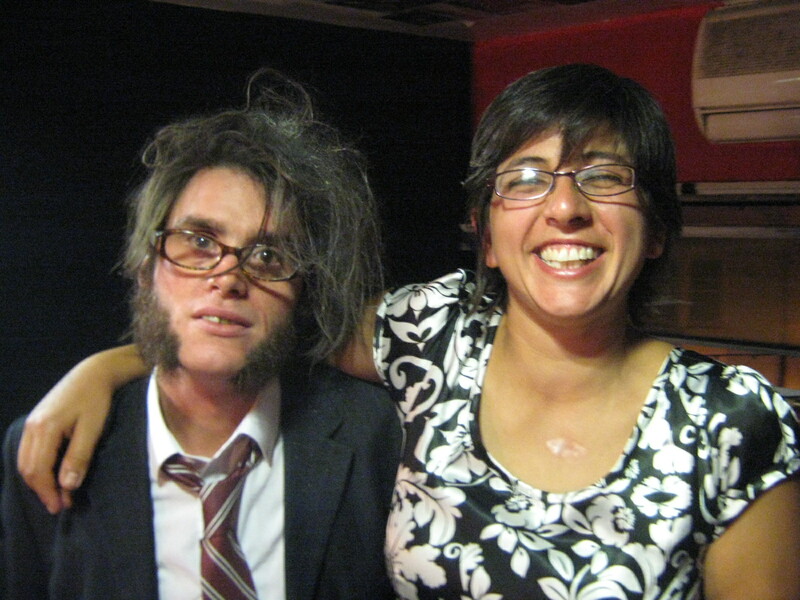 I’d never been to one o f their nights before, so I had no idea what to expect – and hoping very much that they could do justice to the great man himself. They did so, and incredibly well – it was a gloriously unsettling evening – Anna got grabbed onto the stage and ironed by a terrifying rabbit, Kitty was chased up a rope by a gas-mask wieldin g Frank Booth, and it culminated in an incredible group montage filled with saxophones, exploding babies and dead eyes. 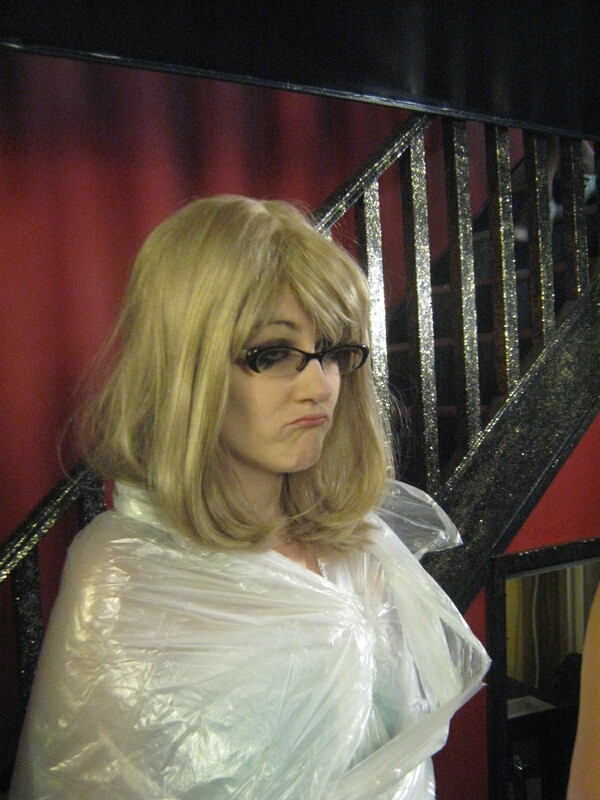 And poor Laura Palmer, left alone on the stage and wrapped in plastic. I also got to see Kate’s band, Gin Panic, for the first time, who make incredible fuzzed out uneasy grunge sounds. And I’ve never seen anyone play a guitar with a saw before, either. At about eleven o clock, I got to premiere my video / story feature, Trapped in an endless cycle of milk consumption. It’s been an exciting but difficult couple of weeks trying to film and write this – it’s not really like anything I’ve done before – a live story in three voices in front of a video of, well, copious milk consumption, and I spent most of Friday finishing off the video and then desperately trying to work out how the hell to get the thing on a DVD. I only had the video finished by 2pm on Friday, so didn’t have a huge amount of time to run through everything with the video, words and audio in one place. I tried it and it was far too short, so I thought – what would David Lynch do? And the answer – slow everything down. I wasn’t really basing it on any bit of Lynch especially, but trying to create the right atmosphere. I think it worked fairly well, although I’m not sure it’s any more coherent than Inland Empire. 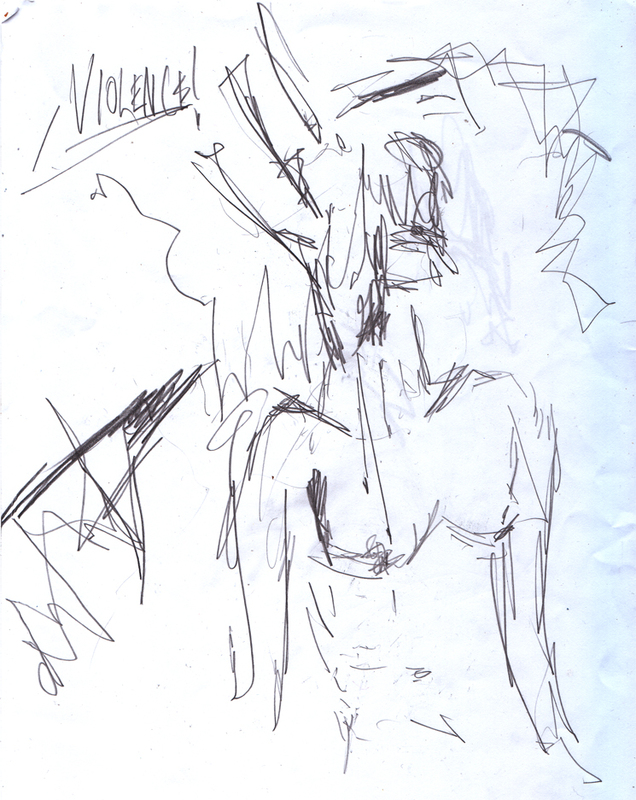 On Monday, it was Artists, Models, Ink, which was astounding once again. It’s quite hard to describe exactly what the night is, but essentially it’s a life drawing night arranged by a team of life models, and is in the beautiful surroundings of the Marlborough Theatre – with added sake, performances, music and blood.This time it was themed around the four seasons. All of the pieces were incredible, but the two which really stuck in my head were Summer, which was a delightfully absurd scene of Georgian decadence, complete with giant wigs, stripey socks, waving legs, and fruit everywhere. It was quite hard to actually draw anything because I was laughing too much. Winter was much darker, and Anna and Johanna peformed a disturbing scene involving blood and antlers and giant metal wings, accompanied by haunting sounds on the cello and saw. It was unique and distressing and utterly brilliant. I’d been struggling to write something for weeks, and was stuck in a morass, the weight of the dead poets on my back. I was sandwiched between Il miglior fabbro, T. S. Eliot himself, and Edna St. Vincent Millay’s bitterly cynical poem, Spring. In the end, I don’t think I did the subject a fraction of the justice that the Artists, Models, Ink team did, who once again created a night that was something very special, even in the overcrowded bubble of art that is Brighton and Hove. Anyway, it’s been a long few weeks – and now the next big project I’ve got coming up is White Night. This is a 13 hour festival in Brighton on Saturday 29th October, the day the clocks go back, and it’s always incredible. 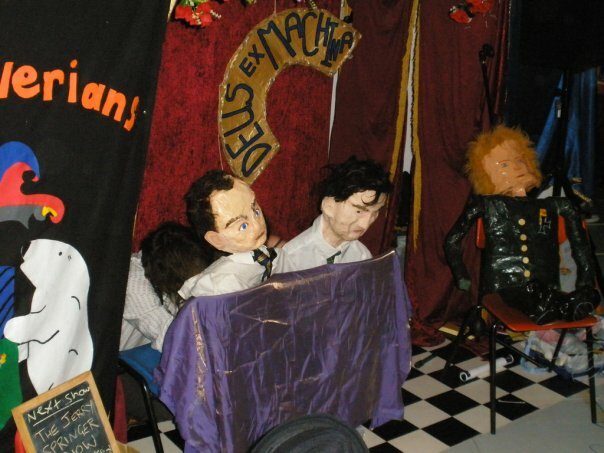 In the past I’ve stood on a box in a pub whilst being verbally abused by drunken football fans (worst gig ever), set up a self-enclosed stage in the Phoenix Art Gallery for a series of puppet shows, drama, breakcore and mayhem (great gig), and had the evening off last year to wander the town in ill-fitting shoes. This year I’m going to be doing two gigs – I’m hosting some kind of twisted quiz show in the Dome with the kids from Shambush (who are super-awesome) – that’s from 10pm – 2am (old time). Then it’s off to the Buddhist Centre for James’s Clown Stories at 3am (old time). I’m going to be doing something there, but I’m not allowed to tell you what it is. The other thing I’m definately looking forwards to is the Beatabet Metahub. As far as I can make out, this is a giant pulsating video-octopus in the middle of Jubilee Square that feeds off video energy from every other White Night event. It might work differently from that. I can’t be sure. No doubt I’ll have more to write about this in the future, but I’m flagging slightly after such a long blog post. As such, I think it probably ought to finish right about now. 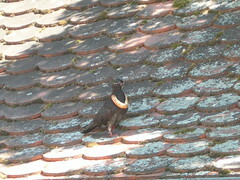 Pigeons wearing a ‘collar of bread’. 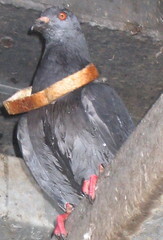 The phenomenon of pigeons wearing a ‘collar of bread’ or ‘bread necklace’ is something that my housemate Jed brought to my attention a couple of years ago. 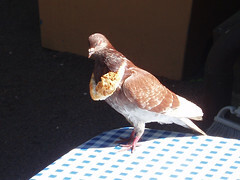 He had seen a pigeon, attempting to eat a whole slice of bread, bite its way through the middle, so the bread slipped around the pigeon’s neck, forming an almost Victorian seeming collar. The pigeon, unable to remove this, would subsequently bob around looking utterly ridiculous, until it could finally free itself from its doughy mantle. Jed didn’t actually witness the removal of the collar, but he surmised that either the pigeon finally managed to tip itself up on end and shake off the collar, or recruit the assistance of fellow pigeons to eat the bread-collar away. At the time, I collected together a series of pictures from the internet, and I thought I’d link to them there, perhaps creating some kind of avian bread-collar resource in order to share the experience of this intriguing natural phenomenon. oh! oh!, and two videos on Youtube: here. and here. There’s a feature on the phenomenon in the pigeon blog. It’s even reached the dizzy heights of the Daily Mail, although the writer doesn’t mention whether the pigeon was also stealing our money and taking our jobs. Finally, although it’s not strictly wearing a collar of bread, I’ve been learning how to edit video recently, and it’s perhaps an appropriate time to introduce my first short film, Pigeon in a Pizza Box.